In se am 2 5”. Style Type: 52660 Skinny Stretch Denim Jeans. There will be no exceptions made to this policy. Color: Blue, Dark Wash. Front Rise: 7.5". Size: 26 x 26. Inseam: 26". Super comfortable with a bit of stretch, these printed jeans are great with a pair of booties and a floaty top for a boho rocker style look. Skinny Ankle Jeans. 77% Cotton, 21% Polyester, 2% Spandex. Style Type: OB435426 Destroyed Skinny Jeans. There will be no exceptions made to this policy. Color: Brass Blue. Front Rise: 8". Size: 26 x 26. Inseam: 26". Flat Waist: 14". Free People Denim Super Flare. These exaggerated denim flared jeans feature a frayed hem and five pocket design. 22% Polyester. 23% Rayon. 2% Spandex. 53% Cotton. Colour: blue. We want to do everything to ensure the item fits as well as the style/look of the item is what you're looking for. United Kingdom. It's against the law and we will not do it. from our vendors. Collar to Sleeve. 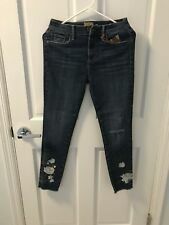 AuthenticFree People blue Reagan raw frayed hem cropped skinny Jeans, size 26". Raw ankle hem gives your look a little edge. Classic 5 pocket jeans. Material: 78% cotton, 15% tencel, 5% polyester, 2% spandex. Color: Tupelo Blue. Style Type: Destroyed Low Rise Skinny Jeans. There will be no exceptions made to this policy. Front Rise: 8". Size: 26 x 25. Inseam: 25". Jeans fit super cute! In great condition. -Length: 33”. -Inseam: 25”. -Waist: 13.5”. High rise. Skinny through hip and thigh. Super flared hem. Flat front. Back patch pockets. Button and zipper closure. Lightweight denim with super stretch. Hand placed sequins, no two pieces are exactly alike. Skinny Jeans with a fun Leaf Print. Across leg opening 5.25”. Sizing Issues are not considered Not As Described. 53% Cotton 23% Rayon 22% Polyester 2% Spandex. Free People. I am human and may have made a mistake, which is why I would like to be able to fix it for you. These are so cute! Super comfy. Conditions: LikeNew preowned Condition. Natural Distressed Look. NO signs of wear. Type: Jeans. Women's Free People Gray Skinny Jeans Size 26, Length-39.5" Inseam- 32"
OLA BRAIDED FLARE JEANS. Lightweight and slouchy these high waisted denim flared jeans feature a braided waistband. Snap closure and zip fly with four-pocket detailing. Frayed hem. Waist: 29 in. 70% Lyocell. Classic low-rise skinny jeans from Free People in a fun geometric, blue-on-blue diamond print. Size 26 - measures 14.5” across waistband, 8” rise, 28” inseam. Great condition. Please hesitate with any questions, and be sure to check out my other listings. Thank for looking and happy bidding! Very cute ankle length skinny jeans!! Good condition. No rips or stains. Size 26. Measurements laying flat: 27” waist, 27” inseam. J020. Perfect for fall, winter and early spring. Great for your next family vacation or ski trip to Aspen, Colorado, Salt Lake City, Utah, Sun Valley, Idaho, Lake Tahoe, California, Los Angeles, NYC, London, Paris, Switzerland or anywhere else. Great gently used condition. Rise 8”, waist laying flat across 14.5”. 2% Spandex. 22% Polyester. 53% Cotton. Ivory Gray White Snake Print Skinny Jeans. By: Free People. Comfortable, uniquely-colored skinny jeans. Flattering and versatile. CORDUROY 5 POCKET JEANS PANTS. Free people jeans. Overall great condition jeans with few scuff marks on back of legs, see pic. Dip into '70s bohemia with free people's belled-and-beautiful jeans, bedecked in bold blooms and flaunting an unfinished hem. Machine wash. Zip fly with button closure, five-pocket silhouette, mid-rise.